White marine paint updated this kitchen. 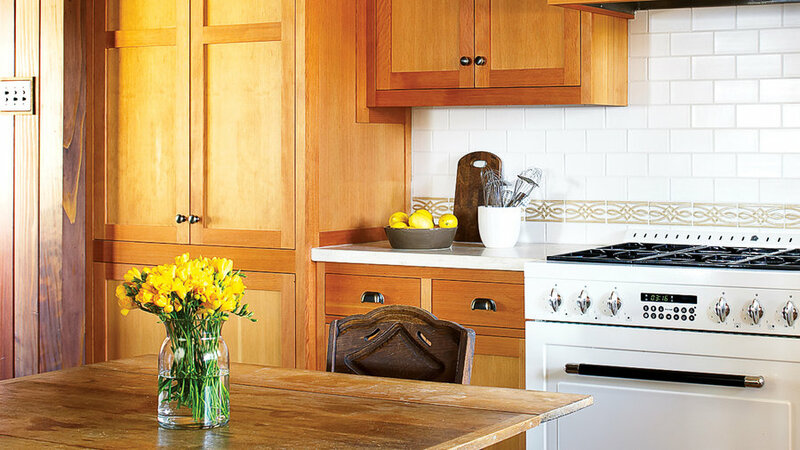 Read more about this kitchen makeover. I once bought a house whose kitchen was darker than a Chekhov play. The cabinets were dirty brown. The wallpaper was faded and spotted with grease. I knew I had to lighten up that space before I moved in a single dish. So I painted the cabinets―instant transformation! Many of us have cabinets in good condition, but the finish is cringe-inducing. Fortunately, there’s an easy, albeit time-consuming, fix that doesn’t involve taking a sledgehammer to the room. You can paint the cabinets any color you like and top them off with new hardware. Before you get too excited, you need to make sure your cabinets are paintable. Solid wood, wood veneer, and metal cabinets take paint well, but laminate and melamine finishes do not. If this is what you have, there is still a way to give them a face-lift, but it’s best done by a professional. Look in the yellow pages for cabinet resurfacing companies. They will sell you new doors and drawer fronts, and put a veneer (a thin outer layer of higher-quality wood) over your current cabinet frames and sides. You need high-quality paint for this project. The last thing you want is to invest this much time and effort only to have your paint peel a couple of months later. Satin or semigloss paint is the most scrubbable, but you should choose a finish you like. Using a paintbrush will leave visible marks, which may or may not bother you. A spray gun will create the cleanest finish. If you decide to rent one for this project, practice on some scrap wood first and make sure you cover all the surfaces you don’t want to paint with plastic sheeting. The microscopic overspray will get all over the room. The quickest and easiest way to paint cabinets is with a foam roller, which leaves a very light pattern on the surface. Use a 4-inch or 6-inch roller to paint the frames and doors. You’ll need to remove the items from your cabinets and set up a work area for painting doors and drawers. Your kitchen will be unusable during this time, so you’ll want to work as quickly as possible. But depending on how large your kitchen is, it may take you a couple of days just to apply the first coat. Set aside at least 4 days, including drying time.